Why have trucks become so popular lately? Even though many sedans and coups have better gas mileage and vans provide more space for passengers, nothing provides the flexibility of a truck. This is especially true of contractors and many open-air jobs. Even a foreman who drives alone mostly can sometimes help out on hard days by offering his truck bed as extra storage for whatever the operation. It can do all this while still being able to carry five passengers. Trucks make a solid statement as the workhorse of family, professional, and country life. While the virtue of trucks go on forever, much of that is due to the high quality workmanship that allow trucks to last a long time under strenuous requirements. Supply and demand however is a doubled-edged sword that quickly meets the rising market demands while at the same time creating a very serious problem. That is the dilemma many truck manufacturers face. The demand is so great that two problems arise. The first problem is that quality truck manufacturers are either sticking to their high quality standards but don’t have many trucks in stock, or the company is using sub-standard parts to fill in Demand. In the case of the first issue with quality truck manufacturers, stock is often desperately scarce; the second issue results in trucks needing frequent repairs, and often breaking down right after the warranty expires. The second problem is far more serious. Car companies, often from overseas release new trucks that were never meant for the serious workloads that pick-up standard brands like Chevy, Ford, and GMC can accomplish. This is often due to vehicles being built to look like trucks, but having poor quality plastics lining the bed; or worse, the engine, drive-train, and suspension could all be designed to be used on a car, which will lead to problems should the pickup ever attempt to tow or carry a load. Research is your greatest tool against the fancy ads and incentives that get you to buy a bad truck. Look up reviews not only for the truck, but the dealership as well. 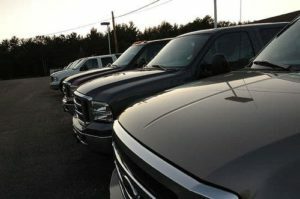 Make sure that the dealership has quality trucks with good reviews. It is a bonus if they have a service center that sells authentic parts. Buying a second hand truck from a less-than-reliable dealer for a good price can often be due to the car being fix up with new, non-stock, substandard parts.